Avraham Fried, Shloime Daskal and guitarist Moshe Orenstein were choreographed at the Razag hall in Crown Heights for the “Japan Song.” COLlive got an exclusive peek. Smoke filled the Razag ballroom in Crown Heights Sunday as a camera crew filmed the music video for a song that will raise public awareness and gain support for two Yeshiva bochurim imprisoned in Japan. Chile-born independent filmmaker Mauricio Arenas is directing the video together with Danny Finkelman and Ilya Lishinsky. The three also collaborated on the Unity song for Sholom Mordechai Rubashkin. Since April 2008, Israeli bochurim Yoel Zev Goldstein and Yaakov Yosef Greenwald have been incarcerated in a Japanese prison after drugs were found in suitcases that they were carrying for someone else. 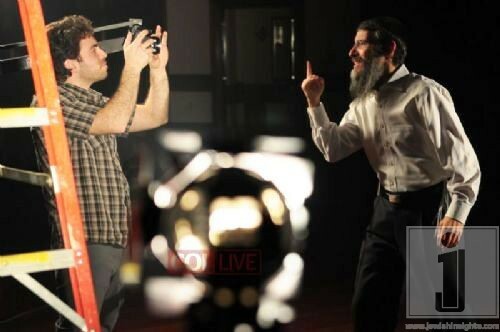 Musician Moshe Orenstein was also present at the video shoot. COLlive.com got an exclusive sneak peek into the filming.